The Tirdae Kalon (Q. Guardiens of the Light) is the Sword of the Blue Circle - a group of nine magic users from all realms linked together with rings made by Crys Menelrana and the strong support for the good. The Blue Circle was set up by Lardin Aril to fight the Court of Ador at the side of the Guild of Elements. Quendil Harnastin Mentalist Ring Sindar-Edain, Bard/Sage, born in Anorien as son of a Gondorian noble house. After a few unpleasant years as an officer in the Kings Army he went to Dol Amroth and became famous as bard as well as one of the Princes best diplomates. 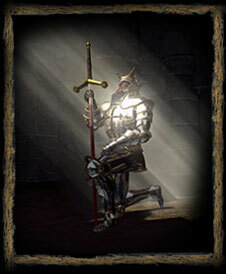 Traveling in the south he became more and more a knight of the light - a knight with heart and word, not with arms. Aranlys Eldanar DreamLord Ring Elven Mentalist/Seer, she is the grandchild of Valakar, Ruler of Taaliraan. Once a member of the Darin Teserath, she still has good connecting with them. Iralussiel en Perilussi Magician Ring (*lost) Elven Magician/Mentalist, Princess of Perilussi - an old elven realm in todays Arthedain. She was captured in the land of dreams for hundreds of years until Quendil led her a way back into the world. Her ring is lost on Thuriac Codya in the hands of a Magician named Ar Gultathorn, and in 1690 she starts a voyage with help of the Tirdae Kalon to get the ninth ring of the Circle. In 1697 she nearly got it with the help of Quendil, but in the last moment the Evil Magician escaped. Veryal en Cimoniemor Astrologer Ring Elven Seer, although blind he sees many things other do not see. He is the oldest member of the circle still on Arda and alife. He came from Tul Harar, but had to leave after Sen Kalim dealed with Tartas Izain and the Southern Dragon captured the town in 1684. Agonar of Teusillia Sorcerer Ring Womawi, once one of the Angulions best pupils on the dark paths. Some still are not quite shure about him. He came with Quendil from Unvirnay after a vision he had. He knows he has to build up the Tirdae Kalon - and he does! Moranar Sage Ring Noldor, a lady of the fire she once worked in the Gwaith-i-Mirdain. She left them with a couple of others and lived in Amon Lind after Annatar started to influence the halls of the elven smiths. Randea Ilusionist Ring Elb from the lands far north, his aim is to find his brother - and togehter lead their people out of slavery. The rings enhance the special abilities of the wearer. In addition it gives them the use of three Base List to Lv 50. The rings can only be worn when all other ring wearers have agreed. To give a ring to someone and make him member of the group takes place in a gathering, where a link to the new member is set up. A member in need can call for help, and every other member feels it regardless how far they are away. The links between the members are mystic, again based on the special abilities everyone has. The difference forges the stength, togehther they have much more strength than the addition of the individul powers. Name Lvl Hits AT DB Sh,Gr WpnI WpnII Mis. MM Prof. Founder of the Tirdae Kalon and Member of the Blue Circle. The first Paladin of the Tirdae Kalon. In 1686 he sucdeeded in finding the Insignias of Obet for the leader of the Kalas Taibirauk (Apy. "Sand which drifts free"). He helped Quendil to catch Seregul in the Domions and in 1690 he starts a voyage to Thuriac Codya, where one of the nine rings is lost. Once a Lord of the Dominions, he got influenced by Malezar and started war with the other Lords. A true Warlord and longtime Pirate adventurer, his military abilities are strong, and few others have seen the sea from Dol Amroth to Unvirnay. After he got caught, the trial of Lords send him to exil. Quendil tried to show him on the right way, and that not every tool is acceptable to success. "The tool forms the user" - as Quendil always says. After many discussions traveling together Seregul accepts this point. He leads the ship which brings Lokrukan and Iralussiel to Thuriac Codya. Still seeing it from the view of a fighter, its time for payback on the dark side. Numenorian Prince of Deldunair in the northern part of Kygaris Ahar. In 1695 his home kingdom was distroyed and most of his brethen were killed. In 1697 he gave his life to clease a tainted artefact with his own blood, but Seregul managed to rescue him with water from a holy well on Arg Simoreg, the home of the Aren Rath. Friend of Turalyon. He followed his friend, when Turalyon went to find the Tirdae Kalon. The Tirdae Kalon has 25 of the Guardians. A few brothers: Vardamir, Elentir, Raen. Members of the Tirdae Kalon have the special abilitiy to cast an armor that seams like a reflection of a nightly sky. Mostly they travel in groups of three. Their sign is a star with nine edges, formed by three triangles. The whole group collects about two dozend people. Like in the early days of Numenor, or like of the elven kind, the Tirdae Kalon are fighters, philosophs, scientist and spiritual people all in one. Some even have a bit of magical knowledge above the gifts granted by Varda. The members of traveling groups fit together with their special abilties and personal likeings. They all found together to from an order of light, be the Sword of the Blue Circle who stands against the eveyone who stands against the Valar and support Morgoth - especial the Court of Ardor.